If you’re thinking about adding chickens to your lifestyle, there are several important things to consider before you purchase your first chick. First, you must decide if you want chickens solely for eggs or if you want them for meat. Some chicken enthusiasts raise both hens and birds that will eventually be fryers. The next big decision is what breed of chicken to raise. You should choose a breed based on climate hardiness, temperament, egg laying or meat potential and ease of care. One popular breed that many backyard chicken hobbyists love is golden comet chickens. This type of bird has a lot to offer the new chicken farmer. Golden comet chickens are a great choice to either start or add to your flock. This chicken comes from crossing two other established breeds, the Rhode Island Red and the White Leghorn. 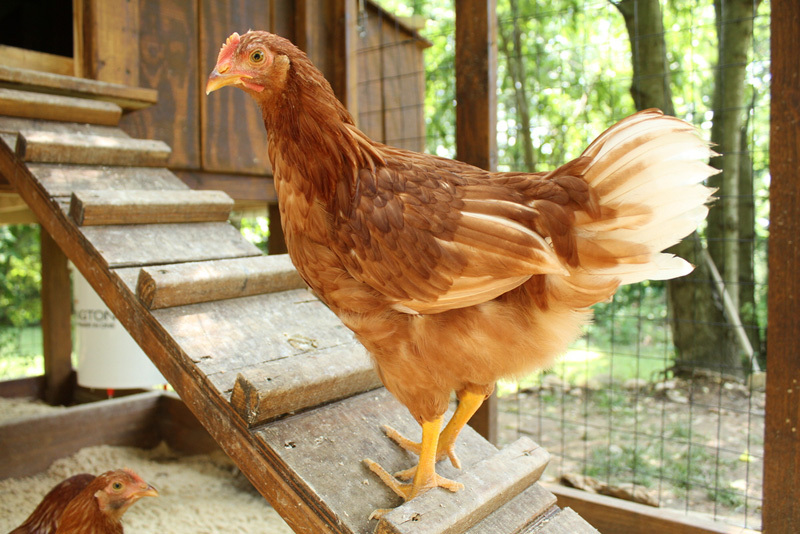 If you’re just starting out, golden comets would be a good option as you learn about the basics of raising poultry. Here is golden comet breed info that may be helpful in your decision when choosing the right kind of chicken to raise. Easygoing Temperament – Golden comet chickens are known for being sweet and docile. These birds will most likely follow you around affectionately, so they make a great breed for families with kids. Excellent Egg Potential – Compared to other hens, golden comets are super egg producers. Golden comet eggs are large, brown and flavorful. You could potentially get seven eggs per week from your golden comet hen. Color and Look – Only the females of this breed have the characteristic golden color. Females also typically have white lacing throughout their feathers. Male golden comets come in white. Comfortable in Weather – Golden comet chickens can do well in both very warm climates and colder temperatures. That way, your chickens can get that outdoor time for longer periods of the year. Space Requirements – Your chicken coop needs to be spacious enough for your flock. If there is additional space outside of the coop to roam, allow for four square feet per bird. If your chickens will always be in the coop, increase that space allocation to 10 square feet per bird. Safe From Predators – Your coop needs to provide shelter and safety to your flock and protection against predators such as raccoons, foxes or coyotes. Cover your coop in chicken wire that will keep these predators from destroying your flock. Free From Rodents – Additionally, you don’t want smaller creatures such as rats or mice to get into your coop. Pay attention to the flooring of your coop, and keep any small access points secure from possible pests. Comfortable for the Chickens – Next, add features to your coop to help your golden comet chickens settle in. A few secluded egg boxes will help encourage your hens to lay plenty of eggs. Make sure you place a roosting pole inside for your birds and have an easy way to collect droppings for cleaning. With an Attached Chicken Run – An attached chicken run can give your birds even more space to stretch out, while also being protected from the elements and possible predators. Once your golden comet chickens arrive, you’ll see why so many farmers fall in love with raising chickens. Be sure to provide plenty of food and water to your new flock. Eventually you’ll start having plenty of fresh eggs each morning for a tasty breakfast.